The size of a block is an interesting issue because it has a significant impact on both the internal workings of the block itself (the ability to build on it with a certain amount of flexibility) and the external workings of the city (small blocks seem to produce much more walkable and well-connected environments). If it is generally understood that larger blocks (super-blocks) are more flexible in development potential, and smaller blocks produce better cities, at least for pedestrians, then there should be a happy range of block sizes that addresses both of these issues successfully. I think, based on a great deal of experience, that the perfect block size is 240 feet by 360 feet; but more about that later. First a quick example of how we understand block sizes from a pedestrian perspective. I am standing at the corner of Lexington and 32nd in Manhattan, and I get a call from a friend who wants me to come have a cup of coffee. If this friend is at 42 and Lexington, about 2500 feet, or half a mile uptown, I immediately agree, thinking how nice it will be to walk those 10 blocks uptown. And it is nice. Walking uptown (or downtown) in Manhattan is an extremely pleasant, comfortable experience, except at those times of day, and in those areas, where tourists are so plentiful that the sidewalks come to a standstill. But if that same friend is crosstown, at say, 6th and Lexington, I will probably decline, or at least think twice about accepting. I immediately associate this walk with a much less pleasant experience than walking crosstown. But it is exactly the same distance, 2500 feet, half a mile. Why is it so much more comfortable walking uptown than cross-town? I think the answer lies in the physical environment. As you are walking uptown you pass quickly through a number of intersections, over a lot of perpendicular streets that capture your attention and relieve the monotony of a singly focused walk. There are many changes along the way, so your senses are more attuned and active. This is not dissimilar from a transatlantic airline flight with a series of really good movies (or a good book), and one in which you have forgotten all your books and the video screen at your seat is broken. In the first, an eight-hour flight is quite enjoyable, while in the second, the time passes incredibly slowly, and the flight is excruciatingly long. Walking crosstown in Manhattan is an exercise in passing through very long blocks, with much less change than the uptown trip. Yes, it is the same physical distance, but it is a much longer mental distance. This is important because if our intention in designing cities is in any way an attempt to make them walkable, then we would be well served to understand how people walk and what creates a more walkable environment. 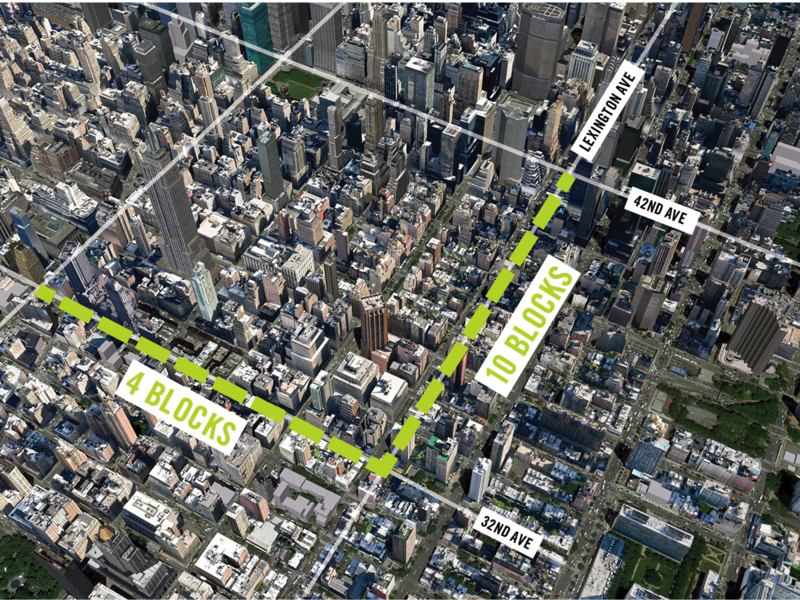 But this example is Manhattan, and even walking crosstown isn’t really that bad, so the city works pretty well. What happens when we look at something more representative of the world we really live in (suburban America)? An example might be the somewhat oddly named Perimeter Center in Atlanta. It is a big, destination shopping district, a place where we can meet up with friends, have a cup of coffee, eat at a restaurant, take a stroll; not unlike Manhattan. But there is a very big difference. That same ten-block distance we walked uptown in Manhattan is only one block here. And to make matters worse, the buildings are removed a great distance from the street. (This matters because as you are closer to physical edges, you perceive time moving more quickly, when things are in the distance one’s perception of time slows greatly. Imagine walking across an open field and you begin to understand). If this area of the city was simply subdivided (yes subdivided, not zoned, much more on that later) with smaller blocks, much of this situation would have been solved simply by distributing the program on various blocks, and creating a rich walking environment. Of course most people will point out that you would then have to do two horrible things, walk outside and (maybe) search a bit longer for a parking space. But if our goal is to create walkable (and flexible – more on that in a future post) cities, then that seems like a fairly even trade off. 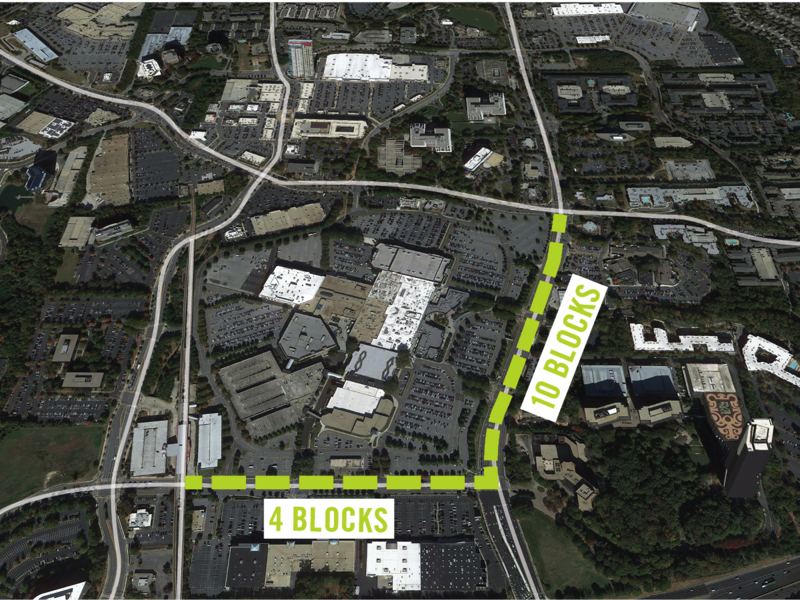 If we don’t care about making walkable cites, then Perimeter Center is just fine. But we shouldn’t design things like this and then pretend that they have anything resembling a real city (yes, there are real cities, the kind we have been building for millennia), and this includes lifestyle centers and every other crazy permutation of a district that people have to drive to. As I continue to write these things, I am going to push the people reading to think about the relationship between our perception of things and the reality of the world on the ground. All of the professions having to do with the design and operation of cities continue to make assertions that just don’t work, aren’t true, or purport to solve problems when they are actually, in most cases, making particular situations worse. Having said all that, it turns out that the solutions are pretty easy. We just have to understand how things work, and try to simplify our responses. So in the case of block sizes, I go back to my original assertion that the perfect block size if 240 feet by 360 feet. I can make this assertion because this dimension accommodates almost every building type in the world, including parking, and it is small enough to give us a nice, walkable environment. Knowing this, shouldn’t we be designing our new cities and large redevelopment areas with this in mind? I certainly think so.